For the efficient cleaning of medium-sized industrial premises. Ride-on Vacuum Sweeper – Dust-free sweeping. Extremely economical. Whilst comfortably seated. 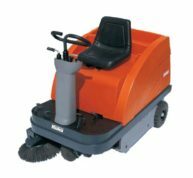 Area performance, up to 7,200m² cleanliness/hour. Indoors and outdoors. The Hako Jonas 900 offers the highest product quality and long machine life as a result of modern manufacturing processes and a strict quality assurance system. It is available in two different models – Petrol or Electric. The heavy duty construction of the Hako-Jonas makes it particularly robust, ensuring it can cope with continuous operation. The generous dirt hopper volumes and long operating times enable uninterrupted work and optimal deployment of personnel. Added to that, a service-friendly design was considered an important factor during the construction phase. This has ensured that the engine compartment is easily accessible for maintenance and service work. The cylindrical brush can be replaced quickly and without the need for any tools. This not only saves time but also contributes to a long service life and low overall operating costs. So, at the end of the day, it’s not only well cleaned but also well saved! A maximum of two side brooms can be fitted enabling thorough sweeping close to borders. They sweep the dirt towards the large cylindrical brush which, in turn, sweeps the dirt into the dirt hopper. A powerful suction turbine, equipped with a panel air filter with a filtration efficiency of over 99 % and patented Hako-R2S filter cleaning technology, ensures the air remains clean. The two dirt hoppers can be removed individually and emptied easily. The hopper lift lever, which is easy to operate, enables the fill level control to be controlled or larger pieces of debris to be thrown in at any time.